Getting a moses basket mattress is a great choice if you’ve got a second-hand moses basket or if anything happened to your current mattress and you need to replace it. They’re not too expensive and definitely a lot cheaper than getting a whole new moses basket. I’ve put together this guide to make finding the best moses basket a lot easier. I’ve included everything you need to know and then reviewed some of my favourites moses basket mattresses at the end. You want the mattress to fit comfortably inside the basket so it needs to be a nice oval shape and be the right dimensions. I’ve tried to include what brands each one should fit but I’ve included the dimensions as well so you can just measure the length and width of the inside and you’ll find something that fits perfectly. As for depth about 4 cm is just perfect, enough to let your baby sink in a little and keep them steady and on their backs. You want the mattress to be foam. They’re generally too small for other fillings so you don’t get spring moses basket mattresses usually. What Else Does It Need? Hypoallergenic is always a must, foam is already hypoallergenic so it’s just making sure the coverings are either naturally hypoallergenic or treated to be so. A Washable Cover is a good call for dealing with little accidents in the night. Waterproof is ideal but at least water resistant is a really good idea. And it’s time for the main event! I’ve gathered the best moses basket mattresses and given a short review of each. This John lewis mattress will of course fit in the John Lewis Moses Basket! It’s a pretty standard size so should fit in most baskets. The cover is waterproof but not wipeable so you need to wash it if it gets wet which can be a pain because it puts it out of use for a few hours. The filling is top quality and it’s a nice sturdy mattress, your little one will be fully comfortable and be sleeping soundly. At least until they get hungry again! The Mother Nurture mattress fits perfectly into the Mamas & Papas basket as well as a couple of other brands. If you click through to Amazon you can check out some of the other reviews for the full range. 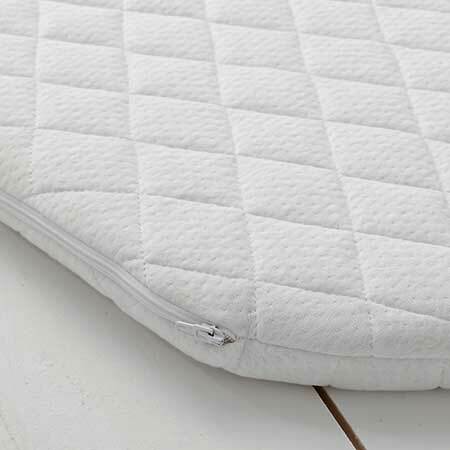 The cover is quilted for added comfort and water resistant for durability plus you can throw it in the wash.
It’s got a firm feel which is ideal for a baby mattress and it’s got a really quick delivery time on it so you can have it in no time. 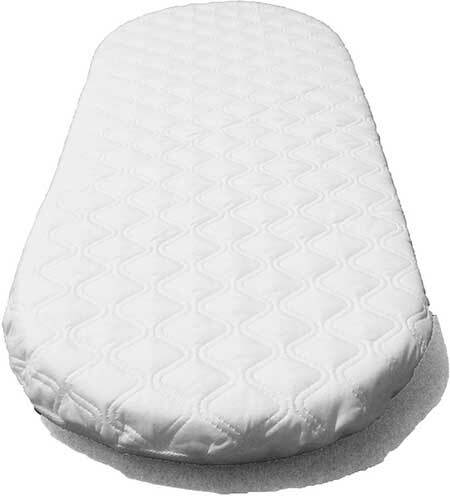 This mattress fits perfectly into any Mother Care moses basket, is hypoallergenic and has a nice washable cover. It’s microfibre so feels really soft to the touch but the mattress is firm enough to support and comfort your baby while they sleep. The cover’s also reversible so if it ends up getting stained you can just flip the cover around and it’ll look good as new. This one fits nicely into most clair de lune baskets again hypoallergenic and washable. Nice and firm but it’s not dual sided so at most you can rotate it if you notice it starting to dent at all. It’s a half cm shallower than the others but that’s still plenty thick enough to support your baby and make sure they sleep well. Is it ok to use a second hand moses basket mattress? I would strongly advise against a second-hand mattress, you don’t know how long it’s been used or what sort of condition it was kept it. Even how old it might be so it may not have the support you need. A second-hand basket is fine as long as you get a new mattress to put in it.